If you are a B2B merchant then this is a must have tool for your store. If you run a B2C website, it can be less effective, but you can still leverage its functionality. 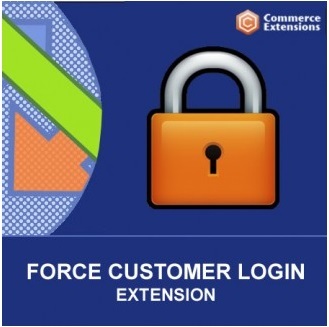 So, why is the Force User Login Magento 2 extension by Commerce Extensions worth your attention? You can find the answer below. Let’s figure out the importance of the extension on the B2B example. Of course, the B2B module doesn’t assume guest purchases. That’s why all clients should be registered and logged in. Unfortunately, the default Magento 2 functionality doesn’t include any features that force store visitors to login or register. 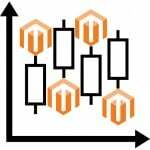 Consequently, a third-party extension should be used, and that’s where the Commerce Extensions Force User Login Magento 2 module becomes necessary. The extension provides the ability to force store visitors to login on any possible page type or area of your Magento 2 frontend. Note that you can choose where to enable/disable the desired functionality. Besides, you can choose a store view to run the module on. And Force User Login can be fully leveraged on a multi-domain website. 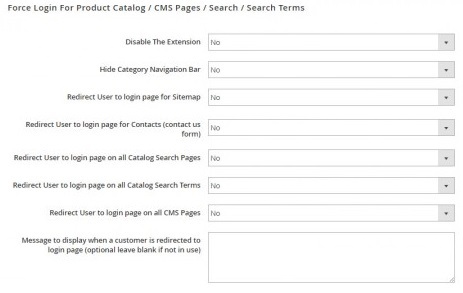 As for supported areas, they include all possible cms pages, both mini and advanced store search areas, search terms, and the Contact Us form. Redirect Users to login page on all CMS Pages. Besides, it is possible to create a message that will be displayed when a store visitor is redirected to the login page. Commerce Extensions Force User Login for Magento 2 allows you to force customers to login in both gentle and rude form, since it is possible to enable only a few options or activate all of them. The backend interface is intuitive and the frontend appearance is straightforward, so it is possible to master the extension without third parties. As for the price, Force User Login for both Magento 2 and 1 costs just 50 bucks.